Stop on by - we'd love to show you around! We serve a huge variety of different types of businesses - everything from flower shops and grocery stores to dog groomers buying ribbon for poodle bows. No matter what type of business you are involved in we undoubtedly have things here to help you out. Signing up online will give you access to all the commercial portions of our website, and we'll have a buyers pass waiting for you when you visit us. Or you can just stop by and do it the old fashioned way with ink on paper. We do require simply that our commercial accounts have a state business license, and are using the product in some commercial manner. The only other thing we would need is a copy of your Washington State Resellers Permit if you are reselling the product and don't want us to charge you tax. Our prices within the warehouse are marked at retail, and you will get the wholesale discount from your purchases at the time of invoicing. We're open to individuals also! Don't have a commercial business? No worries - you're more than welcome to shop. 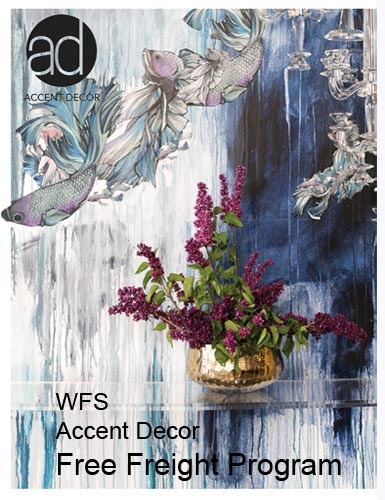 We have one of the largest accent / interior decor selections in the Northwest, not to mention silk flowers and plants, containers, Christmas decor - I could go on... We are truly the Designers' Warehouse, and we'd love to share everything with you. Our hours are 10:00 am to 3:00 pm Sundays, and 6:30 to 3:30 Monday through Friday (closed Saturdays.) No buyers pass needed! One further note: Again, we operate very much as a wholesale market. Please keep in mind that we don't do arrangements or design work. We don't plan events. We don't even hold hands much. We are happy to answer any questions you have, explain pricing and show you through the coolers - and can even do some more detailed planning with you for a consultation fee - but we don't do the work for you. We highly recommend that if you aren't sure of your skills that you hire an experienced designer. If you need a designer to assist, we will happily give you recommendations. Washington Floral has expanded our northwest presence to include all of Washington, and most of Idaho and Montana as well. We are delivering twice a week to most locations within our new territory, with five day per week coverage in the greater Spokane area. Washington Floral Service is a regional floral distributor, servicing Washington, Idaho, Montana, portions of Wyoming and all of Alaska. We don't grow anything ourselves (though a few of us have green thumbs), but we source flowers, plants and supplies worldwide to bring you the widest product line possible. We supply product to flower shops, markets, event planners, independent designers and a wide variety of other types of businesses and individuals. We source and distribute flowers! Our product comes from California, Oregon, Hawaii, Canada, Colombia, Ecuador, Thailand, Ethiopia, Chile... You name the location and we probably have a farm there. We are also working to develop relationships with local Washington flower farms as well, bringing you some of the freshest product available anywhere! We not only carry a wide variety of product in stock in our coolers every day, but we pride ourselves on being able to source pretty much anything that you might need. Yes - we do plants too. We have a large plant department specializing in indoor ornamental green and blooming plants, with product always in stock, both in Spokane and Tacoma. Supplies and decorator products: In our Mountain Branch (Spokane), we carry a full range of basic floral supplies - everything you might need to run a flower shop - and we are adding more items daily. With our Tacoma warehouse as backup, we pride ourselves on having the largest and best stocked hardgoods department on the west coast. You can look forward to having access to over 10,000 different items, including interior decor, silk flowers and plants, high end containers, accent furniture, wall prints... the list goes on forever. CONTACT US Get in touch - we'd love to help!